IRON MOUNTAIN — Monarch butterflies might be on the mend. Populations of the iconic orange-and-black butterflies appear to be up significantly this summer in the northern Midwest, including Michigan’s Upper Peninsula and across the top half of Wisconsin, several experts confirmed this week. They have put out a call for volunteers to help count and record what’s out there before the butterflies depart on their mass migration south to Mexico, which this far north could begin before the end of August. While little hard data yet is available on monarch numbers this summer, several who follow population trends each year say they’ve seen more of the butterflies in the region. Cora Preston, communications specialist for the Monarch Joint Venture project in St. Paul, Minn., said she noticed a definite upswing in the fluttering insects last weekend as she drove across Michigan’s U.P. from Duluth, Minnesota, to Traverse City, Michigan. A monarch butterfly — the twin black spots on its hind wings mark it as a male — on common milkweed, the host plant for monarch caterpillars. Janet Ekstrum, a wildlife biologist with the U.S. Forest Service’s Rapid River office in the Hiawatha National Forest, said she’s seen and heard the same, including from staff at the Ottawa National Forest in the western U.P. 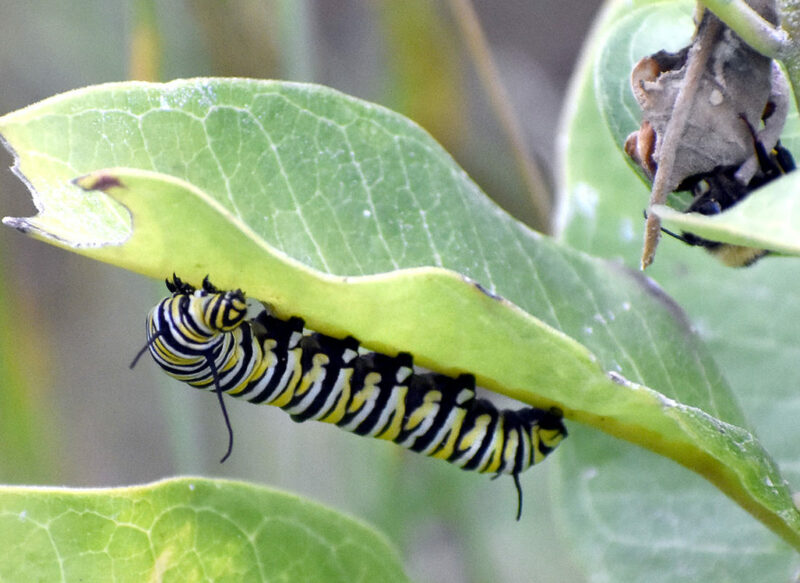 The development may be significant because the once-abundant monarchs have been in steep decline in North America in the past two decades, battered by the clearing of milkweed they rely on in the United States and Canada coupled with shrinking habitat where they winter in Mexico. Preston said monarch numbers have plummeted by 70 to 80 percent since the mid-1990s, going from taking up 18 hectares — the equivalent of about 44 acres — in the mountain fir forests of central Mexico during winter to a record low in 2013-14 of less than 1 hectare, or not even 2 acres. This past winter, the monarch assembly managed a relatively feeble expansion to 2 hectares, or about 5 acres, Preston said. A boldly striped monarch caterpillar traverses a common milkweed. It takes about four weeks for a monarch to go from egg to caterpillar to chrysalis and to adult butterfly. It led in 2014 to the monarch being proposed for federal protected status in the U.S., a stunning fall for what once seemed to be the most common butterfly across much of the U.S. 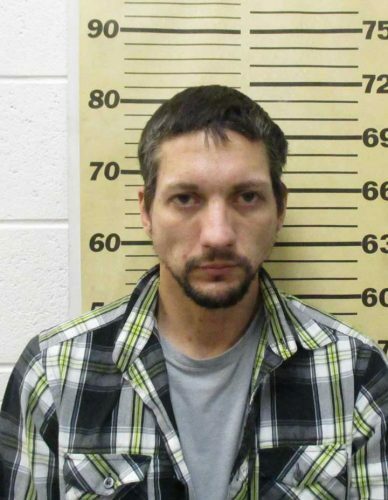 It also forced the public to re-examine what was being done with milkweed, Preston said. What once might have been viewed as a noxious weed — or at least a plant not worth worrying about when spraying herbicide on nearby genetically engineered corn and soybeans — now is being recognized for the vital role it plays as host plant for monarch caterpillars. “We see people allowing milkweed to grow and planting milkweed, which they might not have done in the past,” Preston said. Monarch butterflies, so seemingly fragile, each year manage to travel thousands of miles from as far north as Canada to Mexico in what is believed to be the longest insect migration in North America. Once in Mexico, the millions of monarchs cover the trees, using the cooler Sierra Madre mountain climate to conserve energy until about February. Those adults then start back north, but only as far as Texas and other southern states, where they find milkweed and finally breed. Their offspring develop from egg to adult in about a month and then continue northward, perhaps repeating the cycle of stopping and reproducing along the way, so the monarchs that arrive in the U.P. by late spring usually are two, even three generations removed from the butterflies that left the previous year for Mexico. The monarchs might manage another two to three generations once back in the Upper Peninsula, meaning the butterflies making these flights have only instinct, not experience, to guide them. Having most of the globe’s monarch butterflies clustered each winter in such a small area has made Mexico’s Monarch Butterfly Biosphere Reserve a tourism destination. It also leaves the monarchs dangerously vulnerable should a catastrophic event — a storm, a severe cold snap, disease, predation, the ongoing logging of the forests — hit the site where they gather. Even a lesser setback can erase any gains the monarchs might make during the summer. While it might seem puzzling that the butterflies would evolve to rely on such a concentrated area — “If I were running a species,” Elsner observed, “I wouldn’t do it this way” — it points up the importance of maintaining that part of Mexico as a sanctuary, he said. It also means it’s critical those monarch descendants that do manage to arrive in the north each spring have ample milkweed available to make the most of the breeding season. So this year’s seemingly strong and widespread crop of monarchs and milkweed is cause for celebration. They still must have a successful journey south, then have the right conditions and enough undisturbed habitat in Mexico to survive the winter well enough to head north again and — most importantly — breed in the southern U.S. to produce the next generation that can complete the next migration cycle. The goal, Preston said, is by 2020 to have at least 6 hectares — again, roughly 15 acres — of Sierra Madre forests again laden and painted orange with wintering monarch butterflies. In the short term, at least two efforts will take place up north to try to put some numbers behind the resurgent monarch reports. 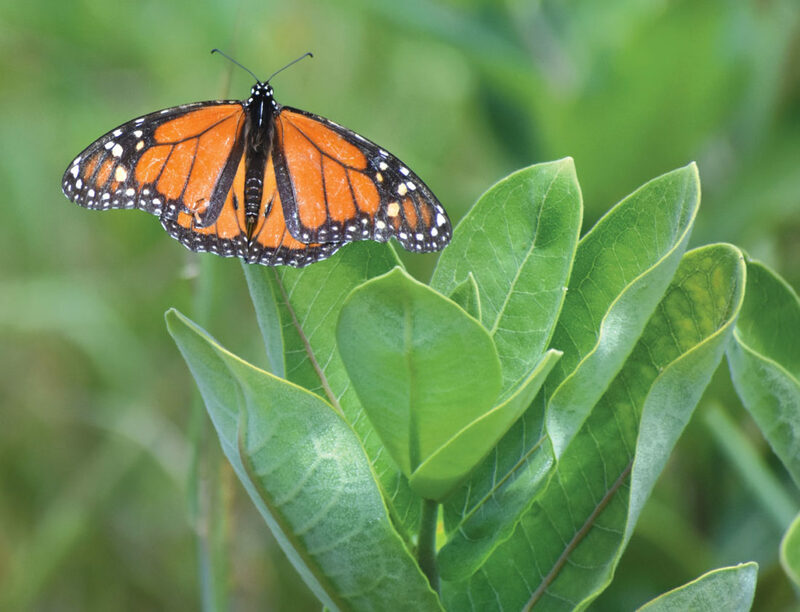 Today kicks off the Monarch Monitoring Blitz, a week-long effort to enlist the public in searching areas that contain milkweed for monarch eggs, caterpillars and chrysalises. Any findings then should be reported at the University of Minnesota’s Monarch Larva Monitoring Project web site at https://monarchlab.org/mlmp. The information provided should help researchers better determine whether what’s being observed is a real, widespread increase in monarch reproduction or perhaps limited to certain areas. 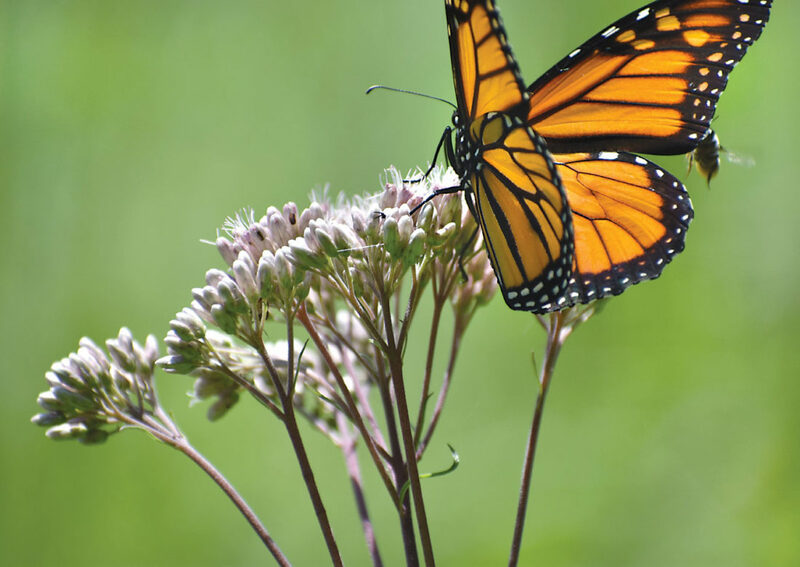 Then in late August, Ekstrum and the Hiawatha National Forest monarch program will need volunteers to help tally migrating butterflies as they arrive at Peninsula Point Lighthouse, waiting for the right winds to carry them across Lake Michigan. Anyone interested in participating can call 906-474-6442. More information on the Monarch Joint Venture project can be found at https://monarchjointventure.org.